I finished the vest this morning before work. All I had to do was weave in a bunch of ends. I'll try to post a photo of me wearing the vest tomorrow. In reading reviews of Twinkle's Big City Knits, I was forewarned that the patterns had lots of mistakes that were not even addressed in the published errata. 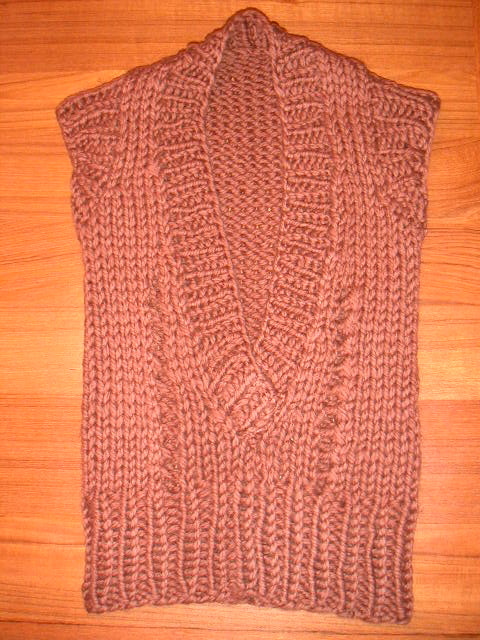 I didn't run across that many errors in the Best Friend Cardigan, but there were plenty of errors in this vest pattern. There is no real instruction regarding the eyelet detail aside from how to create the eyelets. There is also lack of instruction for the short row shaping on the cap sleeves. I was able to figure the knittng out, but not before I had to frog several times on the body and armholes. I would not recommend this pattern for a beginner. yeah your lucky to have figured it out. Also it seems the patterns are for tiny people. But I love those thick yarns. Very lovely. Your a speed knitter I guess. Must be continental.